In 2004 the International Court of Justice in The Hague ruled that the barrier Israel was building in the West Bank violated numerous tenets of international law. Yet construction of the wall continued to the present. What did the decision actually say, and what are the implications of that decision? How do US institutions act in view of this decision? What do those reactions say about US institutions and about the future of international law as a tool for creating a better world? Michael provided an excellent overview of the history of the area since the mid-19th century, as well as much information about the ruling by the International Court of Justice. He, personally, has not given up on a two-state solution which may eventually evolve into a “one-state” solution with some unusual safe-guards for all the people. Michael Batchelder is a member of Jewish Voice for Peace, a group that supports peace activists in Palestine and Israel and works in broad coalition with other Jewish, Arab-American, faith-based, peace and social justice organizations. 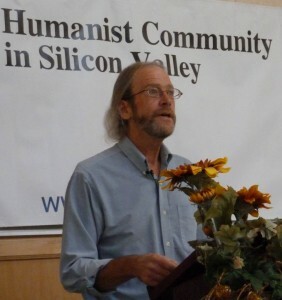 Humanist Community Forum (2013-08-11): The International Court of Justice and The Wall (Michael Batchelder) from Humanist Community-SiliconValley on Vimeo. In this talk, Paul George uses as a framework George Orwell’s famous themes of “war is peace”, “freedom is slavery”, and “ignorance is strength”, as a way of examining modern-day America, which translates to endless war, the national security state, and propaganda (along with lousy journalism). Paul George has been a peace activist and grassroots organizer for nearly forty years. 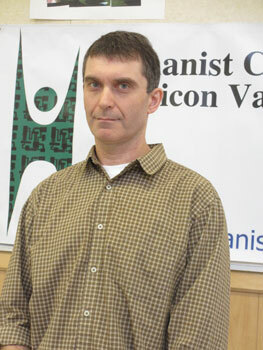 He is the Director of Peninsula Peace and Justice Center (www.peaceandjustice.org) in Palo Alto, CA. Humanist Community Forum (2012-09-30) – Orwell Was An Optimist: The Political Landscape of the U.S. Today (Paul George) from Humanist Community-SiliconValley on Vimeo. 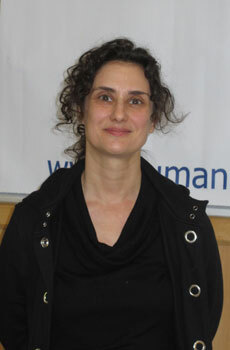 Gilda Bettencourtof the Nonviolent Peaceforce (NP) will provide this program. 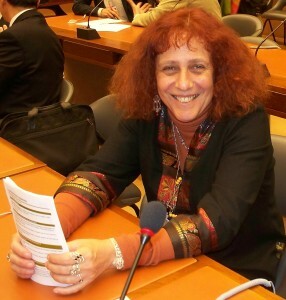 She has been involved for the past 8 years, with people from around the globe who are working to protect vulnerable communities through nonviolent peacekeeping. Nonviolent Peaceforce teams are currently working in the Philippines , South Sudan, and the South Caucasus region. And have also had projects in Sri Lanka and Guatemala. She provided a very powerful presentation regarding NP’s work in South Sudan – one of the poorest nations on the planet – as many struggle to keep it on track to a better future and not relapse into war. By demonstrating the usefulness of unarmed peacekeeping, Nonviolent Peaceforce offers humanity a different way to respond to conflict while concentrating on protecting civilians and reducing violence. The Non-violent Peaceforce is also making a difference in the Philippines as you can see in this video.